Get instant access to a free live streaming chart for the RTS Standard index. This advanced professional chart gives you an in depth look at leading world indices. 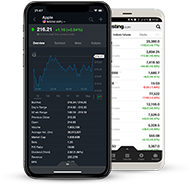 You have the option to change the appearance of the charts by varying the time scale, chart type, zooming in to different sections and adding new studies or indicators such as RSI, MACD, EMA, Bollinger Bands, Fibonacci retracements and many more. You can save your studies and create your own systems as well as having the option to set the colors of each object on the chart.